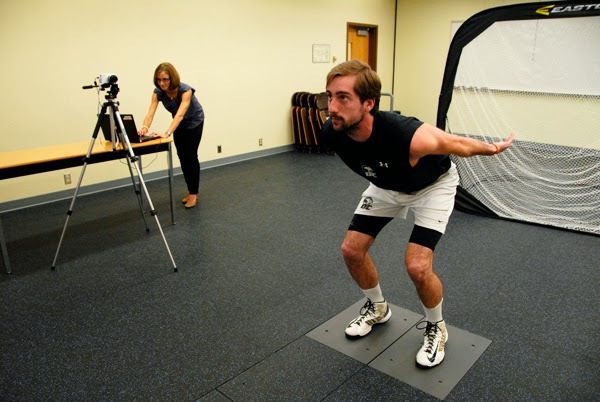 Sport Science students at Douglas College are getting a leg up when it comes to studying how athletes move. A new movement analysis lab has opened at the New Westminster campus as part of an expansion of the College’s Sport Science facilities. The lab gives students a dedicated space to explore biomechanics using high-tech equipment and to gain experience with lab-based research. The centerpiece of the facility is the force-plate system, a tool used to measure athletic movements such as balancing, jumping or running. When research subjects stand on or move across two force-sensitive panels embedded in the floor, data about their movements is captured by computer. This data allows researchers to analyze, for example, how a person shifts their weight when swinging a golf club. The findings can be used to help athletes improve their performance. “It’s exhilarating to think about the hands-on opportunities our students will have with the equipment, for both teacher-directed and student-directed projects,” says Lara Duke, Sport Science Instructor. “The space and equipment open a lot of doors to applied research and potentially to more partnerships involving that research with groups in the community,” Duke says. The lab, which also features video-analysis equipment, will be used by a range of Sport Science students, from those in introductory courses to those conducting their own upper-level research. The new facility complements the College’s existing Sport Science laboratory, which already provides students with access to equipment used to test fitness levels. To celebrate the new lab, Douglas College is inviting the community to an open house on Friday, Jan. 17 from 1-3pm. “We spent the fall working out the kinks with our new movement analysis lab. Now we’re ready to welcome the public for a visit,” says Brian Storey, Sport Science Chair. As a fun activity, visitors to the open house can pick up a golf club, hockey stick, or baseball bat and have their movements measured by students using the lab’s equipment. The open house event takes place in the lab, room 2223, at the New Westminster campus. More information about the Sport Science program is available here.